This predatory Kreature is designed for assassination. It has incredible acceleration, but its stamina is fairly low, so it ambushes its prey and dispatches it quickly by sinking its sabre teeth into the victim's throat. It has loose, leathery hide which allows it to twist around inside of its skin. Its proud, standoffish attitude can make it difficult for a rookie Kreature Tamer to handle. 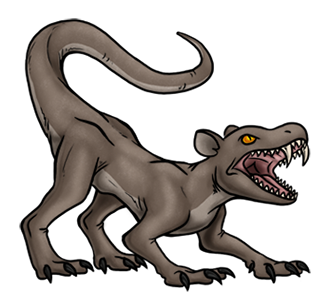 Its wild ancestors are extinct, but the lab-grown breed has gone feral and established breeding populations in some places. I know it’s based on a real animal, but the shape of the torso, the mishmash of reptilian and mammalian features and the lack of any bells and whistles really makes this one seem like one of the most straight up ‘monster’ designs in the archive. I could see this thing in the wild, or in the background of a fantasy series, or in a creepypasta, or floating in a mayonnaise jar in a mad scientist’s lab, or just…. anywhere you’d need a monster. I’m rather fond of this one.